Just one week before graduation, senior Elisha Doerr received good news from one of the nation’s most prestigious colleges. Elisha learned that Harvard University approved his application and offered him a full scholarship of about $300,000 for four years. 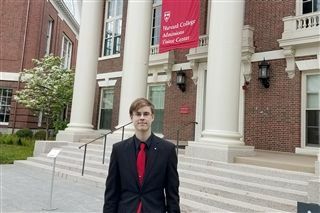 Elisha toured Harvard’s campus in Cambridge, Mass., on Tuesday. He also visited with the pastor at Pine Wood Ev. Lutheran Church, an ELS congregation. After his trip, Elisha made his decision to attend Harvard. Elisha, who is ranked 12th in his class, achieved a perfect 36 on his ACT and took five Advanced Placement (AP) classes at WLHS, including Calculus BC, U.S. History, Psychology, Chemistry and English. A student may have a perfect academic record and still not be accepted into Harvard. Elisha took full advantage of school resources and actively participated in co-captaining the Robotics Team, singing with Inspiration (a vocal jazz group), participating in the Photo Club, performing in drama and musical productions, being a member of both the National Honor Society and Student Council, and volunteering with the school’s Wisco Witnesses in the World program. A record-low, below 5 percent, of applicants to Harvard College received offers of admission to the Class of 2022. "We praise God that Elisha is pursuing his dreams," says Principal Phil Leyrer, "and we are proud of our faithful teachers, staff members and coaches who helped prepare him to be 'salt and light' in the world." Elisha, who is the son of Pastor Christopher and Mrs. Carrie Doerr, plans to attend Harvard University in the fall. His home congregation is St. James, in Milwaukee.